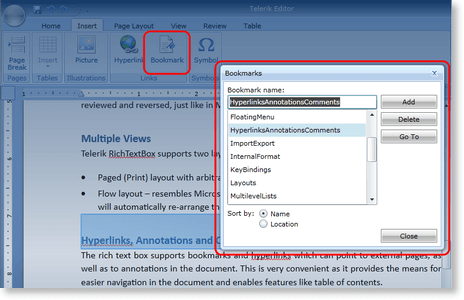 Bookmarks can be inserted in the document and removed through the ManageBookmarksDialog, which is opened on pressing the Bookmark button in the Insert Tab of the default RadRichTextBoxRibbonUI. As all pop-ups that RadRichTextBox uses, the ManageBookmarksDialog can be completely replaced by another, user-defined dialog implementing an interface. this.editor.InsertBookmark(string bookmarkName): Inserts a Bookmark with the name specified. If there is selection in the document, the BookmarkRangeStart will be inserted just before the first selected element and the BookmarkRangeEnd will be added at the end of the first selection range. this.editor.Document.GoToBookmark(BookmarkRangeStart bookmarkStart) : Both methods move the caret to the bookmark specified. As bookmarks with the same name cannot be inserted in the same document, the name of the bookmark can be used as an identifier. this.editor.Document.Selection.SelectAnnotationRange(AnnotationRangeStartannotationStart) : Selects the annotation passed as parameter. Particularly useful, as most methods of RadRichTextBox and RadDocument operate on the selection. For example, if you invoke this.editor.Delete(false), the text of the Bookmark along with the Bookmark itself will be erased. this.editor.DeleteBookmark(BookmarkRangeStart bookmarkRangeStart) : These two methods remove the bookmark. The text in the document between the BookmarkRangeStart and BookmarkRangeEnd is __not__deleted. this.editor.Document.GetAllBookmarks(): Returns an IEnumerable containing all BookmarkRangeStarts. this.editor.Document.EnumerateChildrenOfType() : Returns all Bookmarks in the document. This method can be used on document elements other than RadDocument, in case you want to detect all bookmarks in a limited part of the document, e.g. a Paragraph or a Table.